Originally started in 1941 with one ambulance by members of Freeport VFD who saw the need for an ambulance service in the borough, Freeport EMS was an all-volunteer service provided by the fire department. 60 years later, Freeport EMS is a combination career/volunteer Advanced Life Support Emergency Medical Service provider with 3 fully equipped, state-of-the-art ambulances, 11 Paramedics, 16 EMT's, and 3 Drivers. We typically staff at least one ALS ambulance 24/7 with career Paramedics and EMT's, with additional personnel on staff during busier shifts, and we have about 7 volunteer staff who supplement the career staff when needed. 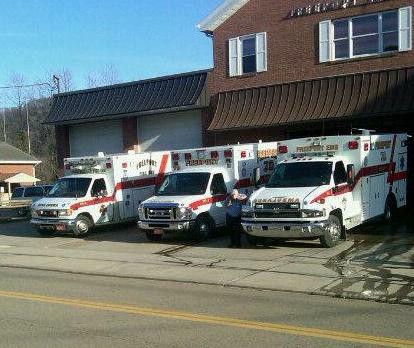 We provide EMS coverage for Freeport Borough, South Buffalo Twp., Buffalo Twp., and Winfield Twp., and have mutual aide agreements with A-K Pulsar Paramedic Response, Saxonburg EMS, Lower Kiski EMS, Citizens Hose EMS, Ford City EMS, Kittanning #6 EMS, and Butler EMS. We also have Quick Response Services in the majority of our area that respond on all EMS calls in their respective areas; Buffalo Township has Sarver Fire-Rescue (Station 36) and Buffalo VFC (Station 27), and Freeport Borough has Freeport VFD when needed as well. See the QRS page for more information. We run between 1200 and 1500 calls a year. We have medical command through the Allegheny Health Network, Allegheny Valley Hospital, which is located in Natrona Heights, PA. We provide medical coverage for all Freeport High School, JV, 9th and 7th/8th grade football games, Freeport Youth Football games, and numerous other events held in and around the Borough. EMS Vice-President: Tom Sweeny, Jr.